Let’s face it, at this point, any chosen market is full. There is likely to be someone, somewhere, doing what you are thinking about doing, or something very similar. Maybe not as well, maybe not as creatively, maybe not as passionately – but someone out there has a business like yours. You must clearly define how you are different than those people – how are you better? in a short, concise, engaging way. If you can clearly communicate what you do, all of your messaging becomes more effective. If your businesses’ value is understood across the entire team, your content becomes better, keywords are easier to identify, your site is easier to understand, and your audience has an easier time finding you and you have easier time converting them. Finally, the success of your business can’t be measured if goals aren’t set. Defining your value helps to clarify your business goals and goals determine your KPIs and KPIs indicate your level of success. 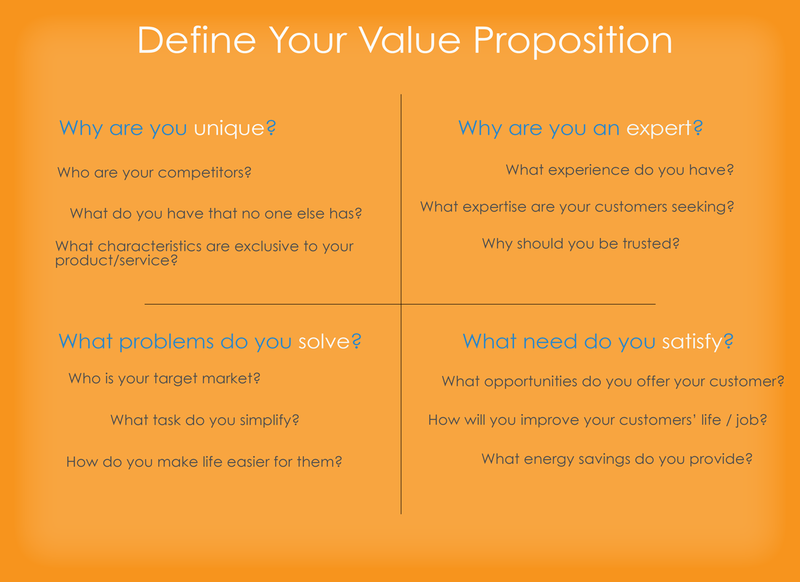 Start by answering questions that define the four components of a solid value proposition. Define why you are Unique, Solution Providers, Experts and Satisfiers.